An overview of the 10 top early- and mid-stage Canadian cleantech companies. 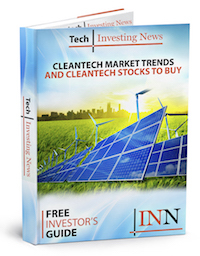 In this article, the Investing News Network profiles the top early and mid-stage Canadian cleantech companies in the market today. This alphabetically organized list draws from the Canadian Innovation Exchange’s list of cleantech companies chosen for the 2015 Top 10 Showcase. The companies were chosen based on excellence in innovation, cleantech solutions, growth potential, competitive advantage and strength of business model. Although most private, investors might want to keep a close eye on these innovative young companies. CoPower is an online platform created to facilitate investing in clean energy and energy efficiency. Essentially, the company helps investors contribute to community-scale clean energy infrastructure projects that combine solid returns and positive environmental impact. Because these projects are already built, the investment doesn’t hold venture capital or construction risks. Hydrostor developed an energy storage solution that strives to address intermittent solar and wind load balancing and peak shaving. The company has invented a proprietary Underwater Compressed Air Energy Storage system that is both cost effective and reliable. Hydrostor formally put the technology into service on Toronto Island in November 2015. Morgan Solar is also a Toronto-based company. It’s an advanced-stage startup that currently employs more than 60 scientists, engineers and other professionals. The company is performing original research into cutting-edge, high-efficiency solar and illumination technologies that incorporate innovative optics and establishing manufacturing processes. Morgan Solar is currently attempting to bring its concentrated photovoltaic module Sun Simba to market. Nanoleaf has created the world’s most energy efficient light bulb. The bulb merges engineering and design with a unique dodecahedron shape. Neurio Technology is a home intelligence technology company that uses a single home sensor and cloud-based analytics. The company can monitor individual electrical appliances from inside the home’s breaker panel without having to place a sensor on every device. Nexterra Systems develops and supplies advanced energy-from-waste gasification systems that change non-recyclable organic waste into clean, renewable energy and power. This technology differentiates itself by delivering lower emissions, higher reliability and greater fuel flexibility than conventional energy-from-waste systems. To date, the company has completed numerous projects in North America and is currently expanding into the UK. Appropriately located in Alberta, Nsolv has an oil sands extraction technology that may significantly increase the efficiency of in situ extraction, reducing greenhouse gas emissions, eliminating water use; it accomplishes these things at a lower cost than incumbent processes. Enbridge (TSX:ENB) and Hatch (CSE:HAT) are among the investors in this project. Opus One has made its name as a software engineering and solutions company that provides real-time energy management through the software technology GridOS. This system integrates with utility data systems to provide grid-management capabilities, also opening greater potential for distributed energy resources. Questor Technology (CVE:QST) is an environmental equipment and services provider located in Calgary, Alberta. The company provides solutions for waste gas and designs and manufactures high-combustion-efficiency waste gas combustors for rent and sale. The company operates in Canada, the US, Europe and Asia. SWITCH Materials holds smart window technology that provide users with control of light, solar heat gain and glare in vehicles. These innovations help to improve automotive energy efficiency. The company was founded in 2007 and today employs 30 professional staff.